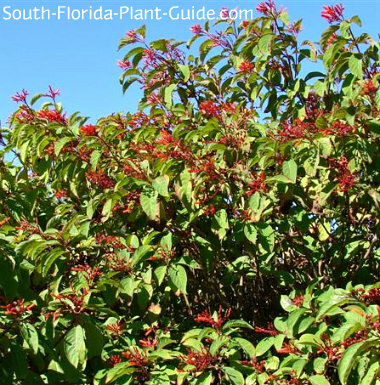 Birds, butterflies and hummingbirds love firebush, a wonderful wildlife plant and one of the prettiest native plants Florida has to offer. The bright red-orange tubular flowers appear on and off all year, more in warmer weather, and in cooler months some of the slightly fuzzy leaves will turn bright red. The bush also produces attractive black berries which attract birds. It has an airy, informal, cottage-garden appeal and looks best (and flowers most) when left to form a natural shape rather than using hedge trimmers to keep it more manicured. There is a dwarf variety (Hamelia patens Compacta) - a relative that's a non-native - which is what most nurseries sell. You may find the native firebush more easily at a native plant nursery, or order it from your local garden center. The dwarf is more compact and can be kept about 3 or 4 feet tall. The leaves are more smooth and the flowers are more yellow-orange than the deeper scarlet blooms of the native plant. This plant is a fast grower that can be kept 4 to 5 feet tall by 3 to 5 feet wide...or let it grow even bigger if you prefer. It prefers a sunny spot though it will grow in part or even full shade, growing less densely there and not blooming much. These moderately salt-tolerant shrubs do best in a location protected from strong winds. They're evergreen unless winter is harsh, and can thin out and look somewhat scraggly in cold weather. This is not considered a cold hardy plant, and does best in Zone 10 - yet even if it's grown in Zone 9B and dies back completely in winter, new shoots usually appear in spring, growing rapidly back into a nice-sized bush or small tree. Native plant myth: People often think, "Native plant? No care whatsoever." Not true. 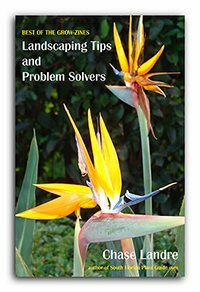 Regular watering and an occasional "haircut" are necessary for most plants - native or no - to thrive and look their best. Plants that get "no care" usually look like they get no care. Soil amendments aren't necessary for native plants, though they can benefit from adding a few scoops of top soil or organic peat moss to the hole. Trim to shape anytime during warm weather. In spring you may want to cut the plant back somewhat for size and to remove any winter damage and promote fullness and new growth. These plants are moderately drought-tolerant once they're established. A regular irrigation schedule with time to let the plant dry out between waterings is ideal. No fertilization is necessary, though a spring application of bloom-boosting fertilizer like bone meal is always appreciated. 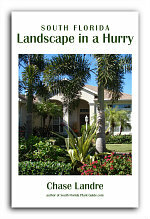 Place these shrubs 3 to 4 feet apart. come out from the house about 3 feet. You can grow this shrub in a large container. 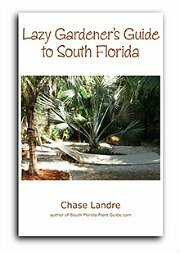 COMPANION PLANT SUGGESTIONS: Pair with other wildlife attractors such as simpsons stopper, lantana, plumbago, beautyberry, blue porterweed, strawberry guava, and sea grape.